Do you wrap your table leaves up in a blanket and put them in the closet and just hope they do not get scratched or damaged? 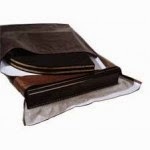 Check out our great line of table leaf storage bags and pad bags. They are discounted when you order a table pad.